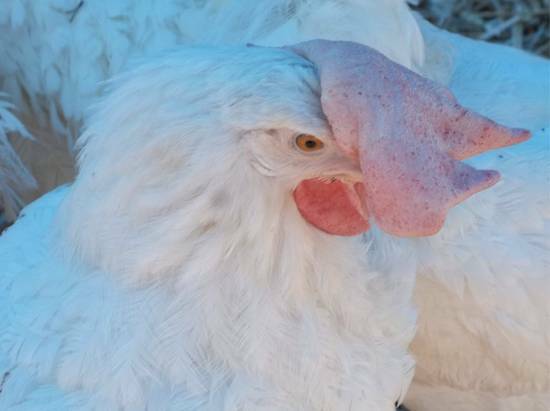 After she was rescued from the egg production industry, she was talkative and kind. Always had so much to say! She would explore, dig in the dirt, and lay outside in the sun. But each day she had no choice but to endure the pain of laying an egg. It weakened her body, and today she died. She died because her reproductive system was exploited, her body was used and abused. She was rescued from a nightmare a year and a half ago. A nightmare that society calls an egg farm. Her life was going to be stolen from her, they were going to slit her throat. But we rescued her and 199 of her sisters. We brought them to freedom, but they were still trapped. Trapped in their bodies that had been bred to lay over 300 eggs every year, when they naturally should lay 12. Rita was talkative and kind. Always had so much to say! She would explore, dig in the dirt, and lay outside in the sun. But each day she had no choice but to endure the pain of laying an egg. It weakened her body, and today she died. Rita died because of the egg industry. She died for eggs. She died because her reproductive system was exploited, her body was used and abused. She was bred to be an egg laying machine. And she broke like a machine. But Rita was not a machine. She was an individual, and she just wanted to live. Read more at United Poultry Concerns (UPC).